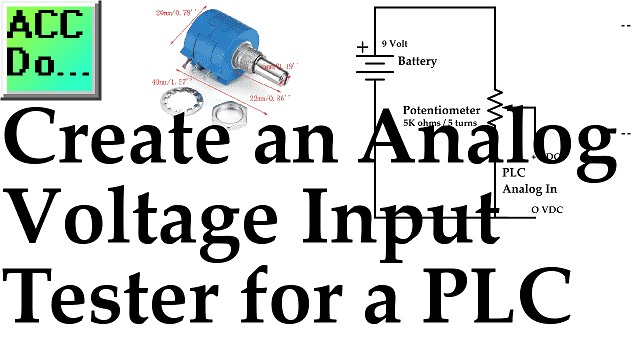 We will create a simple and inexpensive analog voltage tester for a PLC using a potentiometer and a 9VDC battery. The potentiometer will be 5K ohms. This should be enough impedance for most analog inputs of the programmable logic controller. (PLC) Voltage impedance for analog voltage inputs are in the mega ohm range where current input is typically 250 ohms. Our tester will be for analog voltage inputs (0-10 VDC). Check your input specifications before wiring anything to your PLC. I have used this tester for other voltage inputs along with a meter to ensure that the voltage levels do not get out of range for the input signal. Analog inputs to the PLC are continuous and can come in a variety of signals. These signals can come from temperature, flow rate, pressure, distance, etc. Continue Reading! Interposing relay means a device that will separate two different circuits. The isolation can be for current consumption, voltage differences, voltage references or a combination of both current and voltage. We can use these relays to help connect our inputs and outputs on our programmable logic controller. (PLC) Continue Reading!